I know the author and publisher of Alas Vegas. Now I know lots of authors and publishers of roleplaying games—it is part and parcel of reviewing games after all—and this does not impede my capacity to write reviews of their games. It does though, add a certain hesitancy to the task. Alas Vegas is both a complete game and a complete campaign, one with deep secrets and the author directly asks reviewers in the text of Alas Vegas not give spoilers as to what those secrets might be. Now I should point out that avoiding secrets and plot twists of a scenario or campaign is integral to the exercise of writing a review, but it is usually possible to refer to them obliquely. Not so with Alas Vegas. I want to play Alas Vegas. This means that I have not read all of the book. I have read enough to understand what the game is about, its structure and it rules, its extra supplementary material, and most important of all—as will be revealed below—the first Act of the campaign. What this means is that this review of Alas Vegas is as much an anti-review as it is a review and an exercise in writing a review. So, the first question to be answered is, “What is Alas Vegas?” It is a roleplaying game designed by James Wallis, best known as the Origins Award winning designer of one of the first storytelling roleplaying games, The Extraordinary Adventures of Baron Munchausen, owner of Hogshead Publishing—publisher for many years of the archetypal British roleplaying game, Warhammer Fantasy Roleplay as well the first storytelling roleplaying games, the designer of the storytelling card game, Once Upon a Time, and the designer of a forthcoming biscuit-based resolution system. * Published by Magnum Opus Press/Spaaace following a successful Kickstarter campaign and arriving just a little late—and if you think that is something to whinge at, then have some sympathy for the backers of Far West: Western/Wuxia Mashup adventure game—at its core, Alas Vegas consists of a complete roleplaying campaign—also called ‘Alas Vegas’, plus the rules to play it. The book also contains though, advice from an actual magician, a guide to cocktails in Sin City, newspaper cartoon strips from John Kovalic, guides to gambling on life and everything else in ‘The Gambling Capital of the World’, a discussion of grifting and scamming, suggestions on using Tarot in roleplaying games other than Alas Vegas, a complete storytelling game that takes the players back to the foundation of Las Vegas, and three separate campaigns using the core mechanics in Alas Vegas, in turn involving time travel, repentant paladins, and superheroes. *This is probably not true, but the tea drinker in me sincerely hopes that it is. Available via Indie Press Revolution, Alas Vegas is both the name of the game and the campaign. The latter consists of exactly four Acts—a beginning, two middle acts, and an end—with each Act lasting a single session of three to four hours. Essentially the equivalent of playing a television mini-series, which is all the more appropriate because it requires not one Dealer (director), as the Game Master is known in Alas Vegas, but four, one for each Act. Each Dealer is also a player in an Alas Vegas campaign. The game begins with everyone creating characters, including the Dealer, who will have read the both the game’s rules and the first Act. Once the play through of Act I is complete, the copy of Alas Vegas is passed to the next player, who becomes the new Dealer, reads the rules and both Act I and Act II before running Act II, and so on, and so on until the campaign ends with Act IV. So ideally what Alas Vegas needs is four players who will to swap roles in order to complete the campaign, ‘Alas Vegas’. (The other campaigns in the Alas Vegas vary the number of players slightly.) It also needs a good, but not expensive Tarot Deck with illustrations on the cards. The Rider Waite deck is a good choice. A game—or campaign—of bad bets, bad debts, and bad deaths, ‘Alas Vegas’ begins in Act I with the personae (as player characters are termed in Alas Vegas) waking up in a shallow grave in the desert. They are naked, have no idea of where they are, how they got there, and most importantly, of who they are. They are each, a blank sheet—in more than the one sense. In the distance though, a blister of neon lights the night sky. Perhaps the answers to their questions lie there? (None of this can be construed as spoilers. It is at the top of the blurb on the back cover.) What follows though is a voyage of discovery, self and otherwise, as they find out where they are, who they are, and what they do. In terms of who they are and what they can do, this is primarily discovered through flashbacks and what it will reveal is that they are ordinary men and women. Alas Vegas as a campaign is not a game in which the personae have super or supernatural powers. That is saved for the other campaigns in the book. The setting for ‘Alas Vegas’ is Vegas, a hyper-real fabulation of every Vegas you have ever known—vice, crime, gambling, casinos, the Rat Pack, and more. As the back-cover blurb describes it, it is Franz Kafka’s Fear and Loathing, The Hangover meets The Prisoner, and Ocean’s Eleven as if directed by David Lynch. It is all this and more in which the personae must wend their way, make their way, and more if they are to discover who they are. For its mechanics, Alas Vegas employs the Fugue System. This is a set of card mechanics which use a Tarot Deck to help and support the collaborative play of Alas Vegas. The mechanics begin, just as in Alas Vegas, with the personae suffering from amnesia and each player noting down the name of one randomly determined card from the Major Arcana—such as Temperance, The Moon, and The Hanged Man—from the Tarot Deck. This card has no influence on who a persona is or what he can do, but it serves as his mechanical Signifier during the game. As the personae play through a game, they find out who they are and what they are can do—their abilities—from flashbacks, but each persona is limited in the number of flashbacks he can have in each Act. A player can create one for his persona, one for another player’s persona, one for when his persona’s Signifier is drawn, and possibly if they meet a game character or game event, though this is usually as part of the game story. When a persona wants to do something, the Dealer sets a difficulty number for the task, between three and twelve, with twelve being the most difficult. He then flips the top card off the Tarot Deck. If the persona has no relevant ability and the card is from the Minor Arcana and equal to or above the difficulty number, then he succeeds. If below, he fails; if the card is from the Major Arcana, then he also fails and the task cannot be attempted. If the persona has a relevant ability—which of course will have been relearned or regained during a flashback—and the card is from the Minor Arcana and equal to or above the difficulty number, then he succeeds. If below, he fails; if the card is from the Major Arcana, then he automatically and immediately succeeds. Alternatively, if a persona has a relevant ability, then the Dealer can simply let him succeed. This makes for much quicker play. Whatever the outcome, the player is responsible for narrating what happens. The Fugue System is simple enough for straightforward skill or ability resolution, but for combat or contested actions it gets a bit more complex. It uses the game Blackjack as its basis, but as with the rest of the Fugue System, it uses a Tarot Deck for its cards. 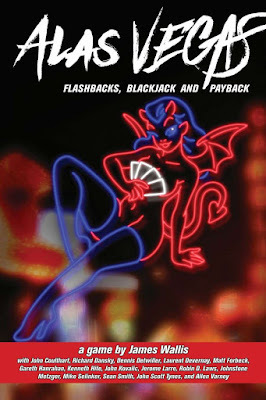 Both the players and the Dealer hands of cards as Blackjack, the Dealer for each of his game-characters—as NPCs are known in Alas Vegas—and the players for their personae. The aim of course, is to get twenty-one or as close to twenty-one as possible with as few cards as possible. Get more than twenty-one and a persona or game-character is stymied and cannot act further. A persona with a relevant ability gets a wild card which his player can use to replace one of the cards in his hand. Mixing and matching hands that can consist of Major and Minor Arcana provides a wider variety of results than is possible in a standard game of Blackjack and a wider array of narrative outcomes that the players will in turn narrate. This includes killing, wounding—both permanent and on-permanent, incapacitating, and even do something astounding, the latter the only moment when the rules stretch beyond human limits. Non-permanent wounds are easy to recover from, but permanent wounds take time and effort to heal and prevent a persona from using abilities that might be associated with the wound. Like other storytelling games, the lack of character mechanics means that it is simple to kill the personae in Alas Vegas. The Dealer is advised against that, for it means that the personae and thus the players will no longer be involved in the campaign right to the very end. Although the rules look a little complex in places, they are supported by some fulsome examples of play and some good advice. As to the campaign itself, ‘Alas Vegas’, Act I does an excellent job of setting everything up, pulling the personae involved into the setting and their mystery, and driving the story up to beginning of Act II. As a player it should be noted that playing through the Act may be a frustrating experience, but that after all, is part of the situation their personae find themselves, and even if there are no easy answers yet, the campaign itself is short and finite—there will be answers. Again, just like the rules, Act I comes with advice aplenty to help the Dealer stage and handle each scene and plot thread. Beyond the campaign, Alas Vegas includes a lot of supporting material and beyond the supporting material, Alas Vegas includes a lot of bonus material. This includes advice from an actual magician, Sean Smith, on forcing wagers, recipes to classic cocktails in ‘The Guide to Drinking Heavily in Vegas’ by John Scott Tynes, Mike Selinker and Matt Forbeck offer up different perspectives on gambling in ‘The Big Board at the Adelphi’ and ‘Alas Vegas: In-Game Gambling’ respectively, and Rich Dansky gives us a lengthy guide to grifts and scams in Vegas. John Kovalic also provides a newspaper strip which plays a role in ‘Alas Vegas’. Lastly, Robin D. Laws and Ken Hite write corollaries to the campaign. In ‘Tarot-Jumping Other Games’, Robin D. Laws explores how to use a Tarot Deck in other games as a storytelling aid, whilst Ken Hite offers up a separate game all together, ‘Killing Bugsy Siegel’. This is a storytelling game with similar mechanics to that of Paul Czege’s Bacchanal, which sees the players attempt marshal their forces and their powers for the right moment to take down the notorious gangster, murderer, and the founder of Las Vegas as a casino town, Bugsy Siegel. Whatever the players manage to do to him, the good news is that he deserves it. The bonus material also includes three separate campaigns to ‘Alas Vegas’ that employ the Fugue System and which all begin with the personae as amnesiacs. ‘Yet Already It Seems I Have Travelled Far’ by Gareth Hanrahan does time travel and memory loss with fractured memories being slotted into a timeline that is reconstructed over the course of the game. Johnstone Metzger’s ‘Warlock Kings’, based on an Allen Varney concept does very dark fantasy with the personae as paladins of light subverted by the Dark Lord and then freed from his control just as he expects them to ride forth and destroy the bright realm of Arborean. Lastly, ‘Remembering Cosmic Man’ by Laurant Devernay and Jerome Larre is a post-modern superhero story in which the players take on the role of two personae. One is that of the amnesiac Specials, the superpowered sidekicks to Cosmic Man, the world’s greatest superhero, whilst the other is the agents of Cosmic City’s Specials Intervention Unit, assigned to investigate what happened to Cosmic Man. These three campaigns nicely showcase what can be done with the format of the Fugue System and its set-up. Physically, Alas Vegas is a thick, if surprisingly light book. It is well written, only needing a light edit here and there, and as a personal project, it should be no surprise that the author’s voice comes out in more than a few chapters. It does feel somewhat plain by modern standards, but there is art in there and is very, very good. You almost wish that artist John Coulthard would do a Tarot Deck based on the illustrations he has done for this book. If there is a fault to Alas Vegas, it is its structure, its bravura nature, and its demands. Not every group of roleplayers is necessarily going to want to buy into its unknowns, its very light rules, its need for multiple Game Masters, and so on. So Alas Vegas is not a game for them, but to others, especially those who enjoy the storytelling games of the last fifteen years, then all of those negatives will be strengths, and Alas Vegas is a roleplaying game that will definitely appeal to them. If there is another fault to ‘Las Vegas’ it is that it can only played the once. Alas Vegas: Flashbacks, Blackjack and Payback is a conceit and a cliché, one that the designer pushes to the furthest extent and asks us to place his trust in him as to what it is about and what will happen. After all, in most campaigns for most roleplaying games, both the Game Master and his players have some idea of what they are going to play, even if only the Game Master knows the exact details. In Alas Vegas, that luxury is taken out in the desert and buried in a shallow grave and unlike the personae of ‘Alas Vegas’ has no chance of coming back. Instead the players definitely know absolutely nothing and the Dealer only knows what he needs to know—and exactly that, no more. The designer also builds on that cliché and builds it directly into the mechanics to really create Alas Vegas, a roleplaying game of self-discovery, self-reflection, and perhaps redemption, which in ‘Alas Vegas’ (and its companions) comes to fruition as the ultimate one-shot roleplaying game.